A partnership between Syracuse Community Connections (SCC) and Falk College’s Department of Marriage and Family Therapy (MFT) at Syracuse University is bringing free-of-charge, confidential mental health services to the Syracuse Model Neighborhood Facility. Children, teens, seniors, and families accessing other services at this site can now access counseling without costly insurance co-payments or traveling to an unfamiliar location. “Many clients may wait long periods of time or are apprehensive about talking with someone skilled enough to listen and guide them through the rough waves in life. This partnership will change lives and homes,” says Merlin Merrain, MPH, SCC director of health services. The new mental health services are provided by Falk College graduate students supervised by American Association of Marriage and Family Therapy (AAMFT)-approved mental health professionals at the Syracuse Model Neighborhood Facility. Appointments are available weekdays and evenings and can be made by calling (315) 671-5817 or (315) 671-5835. Food pantry and food giveaways. During Syracuse University’s Fall 2018 semester, Brandon Hollie G’21, a second-year Ph.D. student in marriage and family therapy, turned his research interest of decreasing violence in urban communities into action. His research, published recently by the National Council on Family Relations, examines gun violence as a symptom of past inter-generationally transmitted injustices focuses on preventing gun and gang violence in the Black community. Hollie began counseling clients at the Syracuse Model Neighborhood Facility this fall and is already seeing an increase in participation. “Increased access to treatment in impoverished neighborhoods is one way to reduce violence, and strengthening the bond between individuals and their families could impact prevention and intervention of gun violence,” says Hollie. “These sessions allow people to express themselves without judgement, and leave feeling empowered to make change in their lives and communities,” adds Hollie. According to Tracey Reichert-Schimpff who directs the Couple and Family Therapy Clinic in Syracuse University’s Falk College and is a doctoral student in the MFT program, students are engaging clients in a location that is convenient and familiar, which may mean that more individuals and families will be willing to receive services. In turn, student therapists will gain a deeper understanding of the needs of those impacted by community violence. “Working at this site offers the opportunity to develop relationships with other programs that are part of the setting. This certainly enhances knowledge and increases sensitivity to and connection with the local community,” says Reichert-Schimpff. Collaborations led by Falk College addressing neighborhood violence and trauma date back to 2008. During a class focused on the signs of alcohol abuse, Timothy “Noble” Jennings-Bey, director of the Trauma Response Team (TRT), connected street life to addiction. That is, why do young men engage in destructive criminal, violent behavior? He shared his theory with Falk public health professors Dessa Bergen-Cico and Sandra Lane. Their on-going collaboration has resulted in 11 journal articles, one book chapter, a video, and dozens of media interviews. In addition to Jennings-Bey, Bergen-Cico and Lane, partners now include Falk public health faculty David Larsen and Arthur Owora, Tracey Reichert Schimpff and Linda Stone Fish from Falk’s MFT Department, Robert A. Rubinstein, Maxwell School of Citizenship and Public Affairs, and Robert Keefe, faculty member at the University at Buffalo. Community partners include Frank Fowler, former chief, Syracuse Police Department, and Helen Hudson, Syracuse Common Council president and founder of Mothers Against Gun Violence, among others. “It is an exciting and hopeful time to have these unique opportunities to work with faculty, students and community members to collectively reduce the impact of trauma and address the root causes of violence in our community. The City of Syracuse has dedicated citizens who are taking bold and innovative steps to reshape how mental health needs are addressed. It is a wonderful synergy of bringing theory to practice whereby the lived experiences of community members are at the core of our work,” says Bergen-Cico. In recent years, grant awards from the Health Foundation of Western and Central New York and the John Ben Snow Foundation have supported workshops to help social service professionals, educators, health care practitioners, juvenile justice workers, clergy, and mental health counselors learn how to identify and address signs of trauma. Reichert-Schimpff notes the collaborations with the community have also increased the awareness and skills of students entering the mental health field. Each year, Jennings-Bey and the team from the Street Addictions Institute, along with Syracuse University faculty, educate MFT students around community violence and street addictions. Students hear directly from community members about how their lives have been impacted by policies and intergenerational injustice. Students also visit SCC to become familiar with available resources. courses and an academic track focused on trauma in medical settings with children. From left to right: Mabin, Hollie, and Reid. Photo credit Jelilat Williams. Courtesy of Calm Connections. 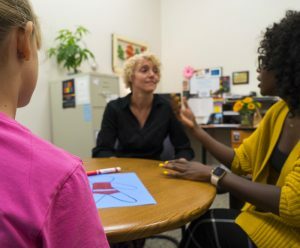 Three doctoral students are on a mission to bring simple mindfulness techniques to children and teens in the Syracuse area to help them manage big feelings. 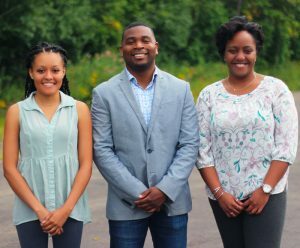 Last year, Staceyann Reid, Aysha Mabin, and Brandon Hollie of Falk College co-founded Calm Connections, a Syracuse-based nonprofit organization that teaches youth mindfulness exercises and yoga techniques such as breathing, attention training, relaxation and stretching, which they can use as tools to help manage emotions at home and at school. By facilitating mentoring and mindfulness instruction, Calm Connections encourages systemic change by teaching compassion and empathy for one’s self and others to reduce traumatic responses such as anxiety, social isolation, and headaches, and promote healthy responses such as self-awareness and resilience, ultimately building more connected communities. The co-founders intend to expand their presence in the community over time with a specific goal of providing weekly programming in the Syracuse City School District. The idea for Calm Connections was inspired by a meeting with campus guest speaker, Andres Gonzalez, co-founder of the Holistic Life Foundation, Inc., hosted by Syracuse University’s Contemplative Collaborative and local school teachers, which explored systematic methods of integrating mindfulness education and practice into Syracuse area classrooms. Hollie is pursuing his Ph.D. in Falk College’s Department of Marriage and Family Therapy. “I selected the marriage and family therapy program at Syracuse because of the renowned faculty, commitment to social justice, and their excellence in the field,” he says. “I did a lot of community work and wanted to be in a place where faculty would continue to support me in trying to bring services to the community. Syracuse was the perfect fit for this.” Hollie is from Chicago, but raised in Iowa. While earning a M.A. in marriage and family therapy from Mount Mercy University, he co-founded Recess, which delivered mindfulness training to help relieve stress among undergraduate students. Now, Hollie serves as the marketing director for Calm Connections. 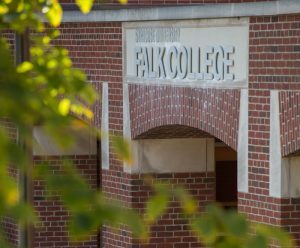 Falk College is rich in mindfulness and contemplative work across several disciplines, including human development and family science, marriage and family therapy, as well as public health, social work, food studies, and nutrition. The College’s Research Center supports an active community of faculty and student researchers, both graduate and undergraduate. To learn more about Calm Connections, visit calmconnectionsinc.org. Calm Connections will host an information session Friday, April 5, 2019 in the Wildhack Lounge, room 336 in the Falk Complex, from 4:30 p.m. to 6:00 p.m., followed by a reception with light refreshments. RSVP to calmconnectionsinc@gmail.com is encouraged, but not required to attend. Community members can park free for this event in Irving Garage. Please mention “contemplative event” at the gate. For accommodations requests, please contact Bonnie Shoultz at bshoultz@syr.edu or Kathy Rainone in the Department of Human Development and Family Science at 315.443.2757 by April 2. The event is co-sponsored by Syracuse University’s Contemplative Collaborative and Hendricks Chapel. 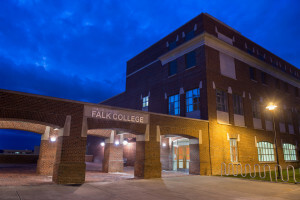 The new Falk College Office of Career Services will provide Falk students with personalized guidance and resources to help them achieve their post-graduation goals, start new careers, or pursue graduate study. Services include one-on-one resume and cover letter consultation, interview coaching, job search strategy and negotiation preparation, digital presence and branding assistance, as well as skill-building guidance in professional communication and networking. Falk Career Services will also provide support to Falk alumni throughout their careers, and act as a liaison between Falk College and employers seeking to recruit Falk students, recent graduates, or experienced alumni. To celebrate the grand opening, first year and sophomore Falk students are invited to an opportunity fair on Friday, February 1 from 1 to 3 p.m. The event will feature several on-campus clubs, professional organizations, and community volunteer groups with employment, service, and social opportunities to share. The following Friday, February 8 from 1 to 3 p.m., Falk juniors, seniors, and graduate students are invited to a networking mixer to meet with alumni, area employers, and professional organizations, expand their professional networks, and prepare for the career and internship hiring process. Both events are free of charge and take place in Grant Rotunda in the Falk Complex. Refreshments will be served. The Falk College Office of Career Services is integrated with Handshake, Syracuse University’s new career management tool. Using Handshake, students can schedule career counseling appointments, find event details for career fairs and employer visits on campus, and discover job and internship opportunities with over 300,000 employers. Students who wish to receive information from Falk College Career Services should join Handshake. Falk Career Services is housed within the College’s Student Services unit, which includes 10 staff members dedicated to providing a caring, comfortable and confidential environment where students can discuss academic, social and emotional concerns. Falk Student Services also provides advising for undeclared students and tracks all requirements for degree completion. Contact Falk College Career Services at falkcareers@syr.edu or (315) 443-3144, or visit Suite 300 MacNaughton Hall. Read the full announcement on the SU News website. A partnership between Syracuse Community Connections and Falk College’s Department of Marriage and Family Therapy (MFT) is bringing free-of-charge, confidential mental health services to the Syracuse Model Neighborhood Facility. Children, teens, seniors, and families accessing other services at this site can now access counseling without costly insurance co-payments or traveling to an unfamiliar location. “Many clients may wait long periods of time or are apprehensive about talking with someone skilled enough to listen and guide them through the rough waves in life. 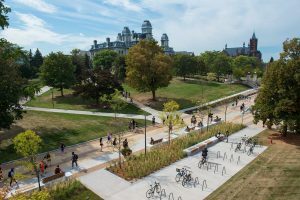 This partnership will change lives and homes,” says Merlin Merrain, MPH, director of health services at Syracuse Community Connections. The new mental health services are provided by Falk College graduate students supervised by American Association of Marriage and Family Therapy (AAMFT)-approved mental health professionals. Appointments are available weekdays and evenings through Syracuse Model Neighborhood Facility, which does business as Syracuse Community Connections, 401 South Avenue, (315) 671-5817. During the Fall semester, Brandon Hollie G’21, a second-year Ph.D. student in marriage and family therapy, turned his research interest of decreasing violence in urban communities into action. 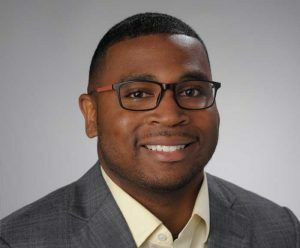 His research, published recently by the National Council on Family Relations, examines gun violence as a symptom of past inter-generationally transmitted injustices focuses on preventing gun and gang violence in the Black community. Hollie began counseling clients at the Syracuse Model Neighborhood Facility this fall and is already seeing an increase in participation. According to Tracey Reichert-Schimpff who directs the couple and family therapy clinic in Syracuse University’s Falk College and is a doctoral student in the marriage and family therapy program, students are engaging clients in a location that is convenient and familiar, which may mean that more individuals and families will be willing to receive services. In turn, student therapists will gain a deeper understanding of the needs of those impacted by community violence. “Working at this site offers the opportunity to develop relationships with other programs that are part of the setting. This certainly enhances knowledge and increases sensitivity to and connection with the local community,” says Reichert-Schimpff. Collaborations led by Falk College addressing neighborhood violence and trauma date back to 2008. During a class focused on the signs of alcohol abuse, Timothy “Noble” Jennings-Bey, director of the Trauma Response Team (TRT), connected street life to addiction. That is, why do young men engage in destructive criminal, violent behavior? He shared his theory with Falk public health professors Dessa Bergen-Cico and Sandra Lane. Their on-going collaboration has resulted in 11 journal articles, one book chapter, a video, and dozens of media interviews. In addition to Jennings-Bey, Bergen-Cico and Lane, partners now include Falk public health faculty David Larsen and Arthur Owora, Tracey Reichert Schimpff and Linda Stone Fish from Falk’s Department of Marriage and Family Therapy, Robert A. Rubinstein, Maxwell School of Citizenship and Public Affairs, and Robert Keefe, faculty member at the University at Buffalo. Community partners include Frank Fowler, former chief, Syracuse Police Department, and Helen Hudson, Syracuse Common Council president and founder of Mothers Against Gun Violence. Reichert-Schimpff notes the collaborations with the community have also increased the awareness and skills of students entering the mental health field. Each year, Jennings-Bey and the team from the Street Addictions Institute, along with Syracuse University faculty, educate MFT students around community violence and street addictions. Students hear directly from community members about how their lives have been impacted by policies and intergenerational injustice. Students also visit Syracuse Community Connections to become familiar with resources that offer hope to city residents. For more information, visit falk.syr.edu. Gun violence is gaining priority attention from multiple disciplines and policy makers due to increasing numbers of mass shootings in the United States. Consequently, the National Council on Family Relations (NCFR), the professional association focused on understanding families through interdisciplinary research, theory, and practice, put out a call for proposals seeking scholarly articles and research in this area. Brandon Hollie G’21, a Falk student in the second-year of his Ph.D. program in marriage and family therapy, has an interest in decreasing violence in urban communities. When his advisor, Dr. Rashmi Gangamma, suggested he write an article for an upcoming issue of the NCFR’s Report Family Focus issue on gun violence, he decided to focus on gun and gang violence in the Black community instead of mass shootings. “I felt that as family professionals, our lens is important in decreasing gun and gang violence in the Black community because it deserves special attention yet it is an area of research that has been neglected,” says Hollie. Hollie’s ultimate goal is to be a chief diversity officer at a university. However, after graduation he plans on a career as a university professor, producing scholarly research while making strides to change policy regarding diversity, access to treatment, and institutional injustices. The article, “Preventing Gun and Gang Violence in the Black Community: A Family Systems Perspective” will be published in the NCFR magazine this December and looks at gun and gang violence in the Black community from a Family Systems perspective. Typically, those who engage in gun and gang violence are labeled as deviant, but Hollie contends that we should not pathologize individuals, instead looking at the problem as systemic. The article examines key points that include gun violence as a symptom of past inter-generationally transmitted injustices; increased access to treatment in impoverished neighborhoods as a way to reduce violence, and strengthening the bond between individuals and their families’ could impact prevention and intervention of gun violence. “I propose that as family professionals we can make changes in our policy to provide space for grief and losses, heal attachment wounds, and explore gun violence as symptom of unfair intergenerational injustices,” says Hollie. Jennifer Coppola, Gift Nleko and Shaelise M. Tor, graduate students in Falk College’s Department of Marriage and Family Therapy and School of Social Work, are recipients of the American Association for Marriage and Family Therapy’s (AAMFT) Research & Education Foundation Minority Fellowships. The AAMFT’s Minority Fellowship Program (MFP) includes a competitive review and selection process of doctoral and master’s students from across the country to support their growth and development as future practitioners in marriage and family therapy. The AAMFT MFP fellowships include awards for doctoral students at the dissertation completion stage of their curriculum, which Coppola received. Nleko was awarded the Now is the Time MFP fellowship as a master’s student interested in service provision to the nation’s youth. Tor received the doctoral fellowship to support completion of her pre-dissertation core curriculum. Funded by a grant from the Substance Abuse and Mental Health Services Administration (SAMHSA), the AAMFT Foundation has created the MFP to support the training of practitioners or practitioner/researchers in culturally competent mental health and substance abuse services, treatment, and prevention. Jennifer Coppola, a doctoral candidate, has a background in human development from the University of Rochester. Trained on the Transgender Treatment Team at Falk College’s Couple and Family Therapy Center at Peck Hall, her current research investigates couple relational processes, including the impact of gender, sexual, and racial minority stress. Her dissertation focuses on attachment and fairness-related relational experiences of transgender women and their cisgender partners. She hopes to progress her research to include conceptualizing integrative therapeutic models that serve marginalized populations. Clinically, her work is dedicated to the transgender and LGBQ+ communities, and multistressed couples and families. She uses contextual and attachment theories, an affirmative intersectional lens, and emotionally-focused couples therapy (EFT). Coppola presents her research work and model of couples therapy nationally and internationally. “I believe in utilizing a self-of-the-therapist approach to training. Cultural humility in clinical practice involves a lifelong commitment to reflection and disassembling power and privilege,” she says. Upon graduation, Jennifer plans to continue teaching in the MFT field, and extend her research. She also has a part-time private practice. Gift Nleko, a native of Nigeria, was diagnosed with polio at age 3. Due to the civil war in Nigeria, she and her family sought political asylum in Houston, Texas, when she was 9. “My experiences as a disabled Nigerian-American refugee inspire my work with diverse, underrepresented and socially disadvantaged populations,” she says. Having graduated from Lamar University with a B.S. in psychology, she immediately enrolled in Falk College’s dual master’s program in social work and marriage family therapy. She has gained hands-on experience providing therapy at the Couple and Family Therapy Center, serving clients with co-occurring mental health and substance use disorders at Family Counseling Services- Cortland, and co facilitating the Domestic Violence Group and Healthy Relationships workshop series at the YWCA of Syracuse & Onondaga County. Gift currently interns at the Syracuse University Counseling Center, providing mental health and substance abuse services, while contributing to a diverse campus environment. Her past research as a McNair Scholar focused on the effect of father absence on adult daughter’s mate selection. She will continue exploring the correlation between father absence, mental health, substance abuse, trauma and relational attachment. Shaelise M. Tor is a second-year doctoral student who completed an M.S. in marriage and family therapy at the University of Rochester. Her current research interests include participatory research with refugee and immigrant populations; the impact of race and cross-cultural relationships in family therapy and advocacy; families involved with multiple systems of care; and relational ethics and attachment injuries. She currently serves clients in an outpatient couple and family therapy center as well as in a satellite, community-based clinic utilizing a postmodern attachment and experiential approach that emphasizes resilience and the impact of power and oppression. “I hope to increase access to culturally humble mental health care and decrease barriers to care by utilizing non-traditional modalities of therapy,” she says. Upon completion of her doctoral studies, it is her goal to be on the faculty at a university where she can conduct research, teach, and supervise future generations of therapists. The American Association for Marriage and Family Therapy (AAMFT) is the professional association for the field of marriage and family therapy, representing the professional interests of more than 50,000 marriage and family therapists throughout the United States, Canada and abroad. The AAMFT Research & Education Foundation funds systemic and relational research, scholarship and education to support and enhance the practice of systemic and relational therapies to advance the health care continuum, and improve client outcomes. Syracuse University’s Falk College will host a Graduate Information Session on Friday, November 2 in Falk Complex, White Hall, Room 335 across from the Falk College Admissions Suite. Faculty, staff, and current students will welcome potential graduate students interested in helping professions in counseling, therapy, public policy, and advocacy; health professions such as public health, epidemiology, nutrition, and wellness; as well as careers in sport and sporting events management. The two-hour event will start at 4 p.m. and will include a brief overview presentation, a question and answer session, and time to meet with faculty and students. Light refreshments will be served. Detailed information will be provided on graduate programs in human development and family science (MA, MS, PhD), food studies (MS), global health (MS), public health (MS), marriage and family therapy (MA, PhD), social work (MSW) as well as the dual degree program (MA/MSW) in marriage and family therapy and social work, nutrition science (MA, MS), and sport venue and event management (MS). Details on Falk College Certificate of Advanced Studies (CAS) programs in addiction studies, child therapy, dietetic internship, global health, food studies, and trauma-informed practice will also be provided. Admissions staff will be available at the information session to meet with students and provide information on academic programs, housing, and scholarships, including the new Falk College Scholarship Merit Award program for high achieving Syracuse University undergraduate students applying to a Falk College master’s degree program in 2019. For more information about this event, and to register for it, contact Falk College Admissions at 315.443.5555, email falk@syr.edu, or visit the event webpage on the Falk College website. Welcome to the new semester. Last spring the SU community was involved in an incident that shocked us. At the time, some in the MFT Department met and issued a statement that we attempted to deliver to the wider community. Because we have not seen it in print, we wanted to make sure it was on our website. The statement is below. In light of the recent horrific videos that showed members of the SU community making statements and performing acts that dehumanize others, we state that we strongly condemn this and other similar behaviors, and the culture that encourages it. These incidents so close to home have harmful impacts on our community. We support efforts to examine and dismantle systems that perpetuate these behaviors, including those within our own campus. In addition to institutional efforts, sometimes being able to talk about how these experiences impact us to someone who will listen and hear your experience, can help the healing process. The Department of Marriage and Family Therapy wants to remind students that we offer culturally sensitive and trauma informed services to the SU community. Our services through the Couple and Family Therapy Center are free, and are at Peck Hall, 601, E. Genesee Street, Syracuse, NY. To contact our services, please call 315 443 3023.